Aviation, railways and roadways are the backbones of a country’s economy. It is very essential to modernise them for the country’s growth. The Indian government, therefore, is planning to undergo a major expansion for airports and railways. The aviation sector is planning to undergo some massive developments. The Modi government under the UDAN scheme is not only going to revamp the existing airports but is also planning to develop more international airports with world-class facilities. Earlier this year, New Delhi’s Indira Gandhi International Airport and Mumbai’s Chhatrapati Shivaji International Airport became the world’s best international airports. 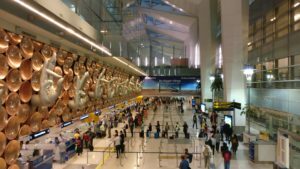 Even though Indian airports continue to rank among the world’s best, the existing quality and quantity of terminals and flights are not enough to address the increasing demand for air travel in the country, especially for domestic destinations. The government has given approval to the construction of several new airports. Recently the government gave nod to the construction of Jewar airport in Greater Noida which will start by the 2018 year end. This airport after its construction will become the second international airport in the national capital region. Another airport that is set for expansion is Goa-Dabolim International Airport. The Airports Authority of India has been sanctioned INR 4 billion for the expansion project. Another international airport is going to be set up in Mopa in North Goa at an estimated cost of INR 30 billion. Sikkim got its first airport, the Pakyong airport which will soon be inaugurated by Prime Minister Narendra Modi. This airport marked the country’s 100th operational airport, built at a height of 4,500 feet in an inhospitable terrain, at an estimated cost of INR 3.5 billion. Similarly, there are new projects coming in for Lucknow, Pune, Chennai and Guwahati airports that will see expansion in terminal areas and the addition of adjunct buildings to handle more passengers. The Lucknow airport is being expanded and will be able to handle 2.6 million international and 11 million domestic passenger traffic annually by 2030-31. Chennai airport’s new terminal building is aiming to achieve GRIHA-4 star rating which will sport green building features. To meet the growing rush of air traffic, Pune airport will undergo expansion and will have a new terminal building, new check-in counters and boarding gates, new road connectivity, solar power system and improved passenger amenities. Apart from these major developments MoS Civil Aviation Jayant Sinha said that as many as 25 airports have been added to India’s aviation network under the UDAN scheme. The airports that are set to start operations in the coming months are, Pantnagar, Jamshedpur, Durgapur, Kullu and Cooch Behar. Als,o airports of 13 cities are getting an upgrade, that include Raigarh, Jeypore, Rourkela, Kanpur, Ambikapur, Jagdalpur, Neyveli, Solapur, Jharsuguda, Bilaspur, Mithapur, Utkela and Burnpur. In this year’s budget, Modi government allocated INR 1.48 trillion for the railways, which is the highest allocation ever for the sector. The plans for railways include expansion along with a better, safer rail experience for passengers. Finance minister Arun Jaitley announced that 600 railway stations across the country had been picked for modernisation. Initially, the government had planned to adopt a public-private partnership model, under which Indian railways would carry out 25-50 pc of the construction work and then give the station on a 99 year lease to the highest bidder for completion, development and subsequent operation. But due to low-key private investor interest, the railways came out with a list of 68 stations earmarked for a facelift through its own resources. The list included some of the busiest stations in the country like old Delhi railway station, Howrah, Patna, Allahabad, Vijayawada, Pune, Bengaluru, Ambala and Chennai Egmore. These stations will get state-of-the-art amenities, including elevators, swanky waiting room, a modern passenger announcement system, new platforms, shopping complex and airport like entry and exit.